While this question, in the opinion of this writer, has no good answer, it does merit some thought, especially if it were to be rephrased to something along the lines of: Okay, I understand that they are all important, but which one is potentially the EASIEST to address and would, thus, likely to have the MOST positive impact on the evaluation of the merits of a proposal?” The assumption here is that things that are easy to do should be the ones that would be most likely for an applicant to be willing to comply with. This, in turn, should at least in principle translate to the greatest positive impact on outcome. Unfortunately, it is here that the underlying logic falls apart. Rather surprisingly, of the thirty reasons for grant application failure listed, the one that is among the easiest to address is also among the major issues that most applicants never seem to practice. We refer here to the failure of applicants to have their completed drafts of their grant applications read by other people before submitting their grant application. We are of the firm opinion that no applicant is fully capable of picking out every discontinuity in a grant application, or failure to describe something in appropriate detail, or include explanations of a protocol, or even misspellings, grammatical errors, or punctuation errors, that collectively detract from a reviewer’s ability to appreciate the applicant’s ideas and proposed methods. Therefore, it is essential that every applicant receive critical feedback from others before submitting any grant application. Moreover, we would submit that it would be difficult, if not impossible, to justify not doing this. At the same time, it appears that this critical final step in the preparation of a grant application is rarely practiced. While it is possible to speculate that a failure to get critical review from a colleague might be a risk that others may “steal the idea”, a fear of harsh criticism from a peer, or a concern about having a request be perceived as an imposition, we suspect that none of these reasons would apply to most applicants. Rather, the real reason is rather simple, namely a lack of time. 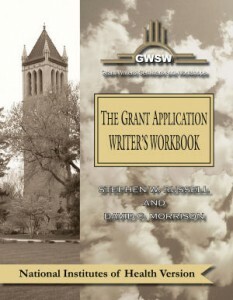 In reality, if one were to ask the vast majority of applicants when they finish the preparation of a grant application, the answer would be “The night before it was due.” While this is certainly a practical answer, it is not a justifiable answer, at least to this writer’s way of thinking. An additional mistake made by many of the very few applicants who do seek out colleagues to critique the initial draft of their proposal is that the critiques are often sought literally at the last minute, In other words, a colleague is approached by the prospective applicant with the request: “My proposal is due on Friday. Can you have a look at it and get back to me by Wednesday?” (Of course, it is Monday afternoon about 5:00 PM.) Even a trusted colleague is not likely to be able to provide a detailed critique, literally at the last minute. Moreover, the colleague is likely to know that any problems identified in the review would most likely not be readily “fixable” at the last minute. It is thus essential that, as part of the proposal preparation planning, an applicant identify three trusted and knowledgeable colleagues (two of whom have interests related to the work described in the proposal and one individual who does not) to agree to read the application. These colleagues should be identified at the earliest possible time (preferably 3-6 months before the due date and a delivery date for submitting the draft to these persons (at least a month before the proposal is due) be promised. This promise should then be honored as among the highest priorities, and all comments and suggestions carefully considered in the preparation of the final draft. We are convinced that every applicant who makes an effort to faithfully practice this additional step in the grant application process will be well served by having done so. This writer does realize, however, that the response indicated above concerning when grant applications are usually finished (the night before they are due.) is not universally encountered. Several years ago, during a seminar presentation at which this topic was being discussed, a member of the audience offered the fact that she had completely finished her grant application a month in advance of the due date. In response to voices of disbelief from the audience, however, she did acknowledge that; “Yeah, I had the wrong deadline!” We should all aim for the wrong deadline in preparing grant applications – provided that the perceived deadline would be earlier, and not later, than the actual deadline!